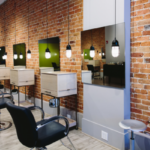 We are Arrow Studio, a beautiful hair salon located in the thriving downtown area of Durham, NC. Our philosophy towards hair is creating the most complimentary and wearable hair, centered around each client’s personal style and skill. We strongly believe in the power of the consultation and really strive to hear what our clients are saying. Our looks range from currently creative to classically beautiful.